Former Hearts striker Gordon Smith has flown to Australia, after deciding it was a case of ‘now or never’ to realise a dream of playing football abroad. 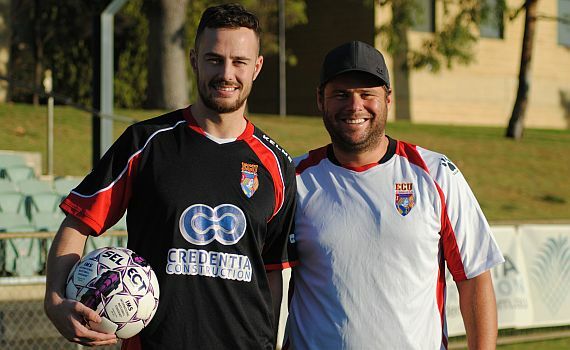 The 24-year-old has agreed a season-long deal with PS4 National Premier League WA side ECU Joondalup, after securing his early release from Scottish Championship side Dumbarton. The striker had spent the first half of the campaign on loan at Cowdenbeath but was keen to ‘try something different’ and was offered the opportunity to go Down Under thanks to a former team-mate of his Dad, Gordon, who also played professionally. Born in Edinburgh, Smith played for Hibernians’ youth teams, but was released by the club and signed for Livingston. He then signed for Scottish Premier League side Hearts in the summer of 2009. He made his debut as a second-half substitute against Dinamo Zagreb in a UEFA Europa League tie. Smith scored his first goal for the club in his first league appearance, scoring Hearts’ goal in a 1–1 draw with Edinburgh derby rivals Hibs at Easter Road. The following season Smith was sent on loan to Stirling Albion, and having impressed manager Jim Jefferies whilst on loan at Stirling Albion, he was awarded a new contract at Tynecastle. On his return to Hearts games were limited to substitute appearances, under new manager Paulo Sergio, although he played against Tottenham Hotspur in the Europa League. Smith was sent on loan to Hamilton in December 2011, and also had stints at, Raith Rovers and Stirling Albion, before moving to Dumbarton and Cowdenbeath. He has also represented Scotland at under 17’s and under 19’s levels.